You must be familiar with the traditional approach to monster hunting: grab a melee weapon, take a firearm (just to make sure), prepare your tricks and witness those creatures flee in terror! But there are other, somewhat unusual methods that rely on a quite different source – which is called magic. What if you could turn the esteemed Van Helsing into a totally different kind of monster hunter? 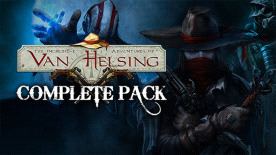 Van Helsing: Thaumaturge DLC now allows you to play a specialist class that will surely spice up your gaming experience. The Thaumaturge is the master of the occult hunting traditions, an expert on the rare mystical arts. Forget the steel blades and those rude guns, and use purely your stunning arcane abilities. You probably thought that Weird Science was your enemy. And yes, you were right, but you can always fight fire with fire, as the saying goes. Or, more fittingly, fight those artificial monsters with arcane machinery: engulf them with poisonous fumes, scorch them with tongues of flame or deploy mechanical allies and traps and let them do the rest. Van Helsing: Arcane Mechanic DLC now allows you to play a totally different kind of monster hunter, a specialist class. The Arcane Mechanic is the master of weird devices, deadly gadgets and occult machineries. Monster hunting just got even more exiting with your customizable Chargerpack and the multi-functional Discharger in your hands. Forget the traditional weapons and prepare your custom-made mechanical wonders. Put on your helmet and the protective goggles and show them the power of true Science!